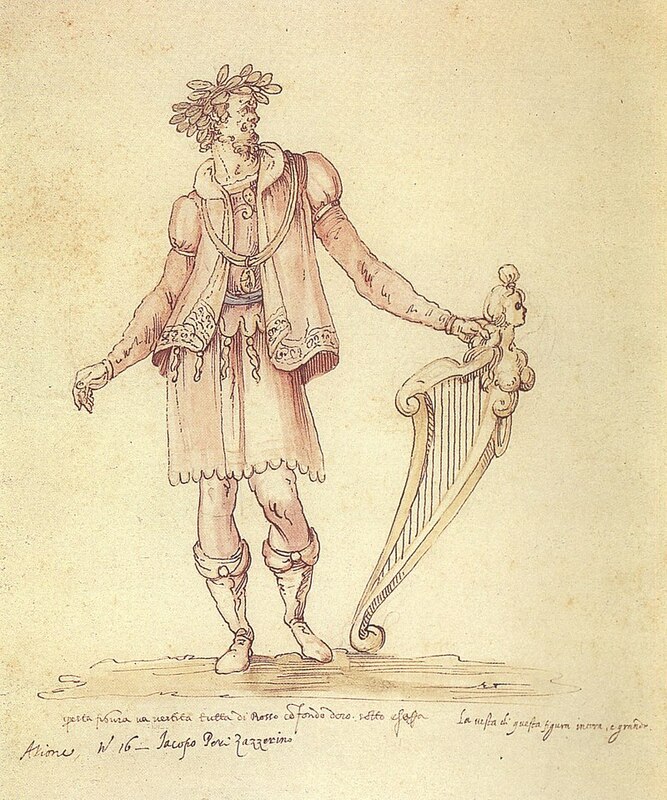 Euridice, an opera by Jacopo Peri, with additional music by Giulio Caccini is the oldest surviving opera, first performed in Florence on this date in 1600 at the Palazzo Pitti with Peri himself singing the role of Orfeo. An earlier opera by Peri, Dafne (1597), is now lost. The libretto by Ottavio Rinuccini is based on books X and XI of Ovid’s Metamorphoses which recount the story of the legendary musician Orpheus and his wife Euridice. Because Europe’s actual oldest opera is lost, this date is the best we can do for dating the genesis of modern opera. Euridice was created for the marriage of Henry IV of France and Maria de Medici. At the premiere, many of the roles were filled by members of Caccini’s entourage, including his daughter Francesca Caccini. Peri composed all of the music for the first production, but owing to the integral involvement of Caccini and his performers, some of Peri’s music was finally replaced by that of Caccini. 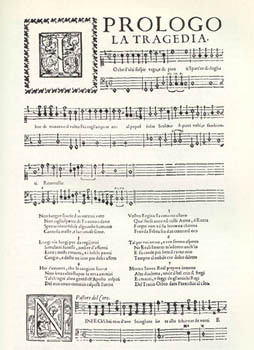 When Caccini discovered that Peri intended to publish the opera with the added Caccini pieces, he rushed to finish his own version of Euridice using the same libretto, and managed to have his published before Peri’s. In his preface, Peri notes that all of the music was completed by the date of the first performance earning his efforts the designation Prima Euridice. In creating the music for Euridice, Peri envisioned a vocal style that is half sung and half spoken. For less dramatic parts he created vocal lines close to the style of spoken language set over a sustained accompaniment. For impassioned scenes he explored stronger and more rapid melodies with steadily changing harmonies. Peri’s critics have observed that within the score of Euridice, he created no musically remarkable examples of either. However, he did use ranges and widths of register, as well as frequency and power of cadences, to distinguish different characters and dramatic moods. The voice and accompaniment are carefully paced to emphasize the tension and release in the text. Rhythmic and melodic inflections in the vocal lines closely, almost scientifically, imitate dramatic speech. In addition, impassioned exclamations are set with unprepared dissonances and unexpected movements in the bass. This extract may serve to show the style of the piece. It is pleasant enough, but not remarkable musically. Euridice has its detractors, but there is general agreement that Peri established sound principles for operatic composition. Classic opera, henceforth, tells a story that exploits the interplay between aria and recitative, and uses a mix of solo, ensemble and choral singing. Peri’s Euridice tells the story of the musician Orpheus and his wife Euridice based on classic Greek legend, but with allowances for artistic license. According to the legend (which is actually retold in a number of ancient texts in Latin), Orpheus was a great musician who journeyed to the underworld to plead with the gods to revive his wife Euridice after she had been fatally injured. The opera opens with a simple melody by a singer representing the Tragic Muse, La Tragedia, and a short ritornello. Shepherds nearby and the Tragic Muse sing a conversation in recitatives and choruses, Daphne enters to notify everyone that Euridice has been fatally bitten by a serpent. All of the nymphs and shepherds gather to celebrate the wedding of Orfeo and Euridice. Orfeo is content after his wedding but is soon interrupted by Dafne. 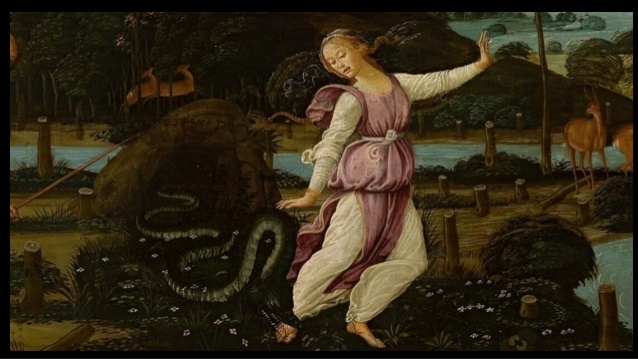 She brings the terrible news that Euridice has been bitten by a venomous snake and has died. Orfeo then vows to rescue her from the underworld. Arcetro recounts that while Orfeo lay weeping, Venus, goddess of love, carries him off in her chariot. This opens with Orpheus pleading with Venere, Plutone, Prosperina, Caronte, and Radamanto in the underworld for the return of his beloved wife Euridice. Nearly the entire scene is carried in recitative. When the act closes, Orpheus is back with Tirsi and the other shepherds. Venus and Orfeo arrive at the gates of the underworld. Venus suggests that through his legendary voice he might persuade Pluto to return Euridice to life. Orfeo succeeds and is allowed to leave with his bride. Orfeo and Euridice return from the underworld and rejoice. If you know the story of Orpheus and Eurydice you will know that the ending of the opera does not coincide with the Greek legend. 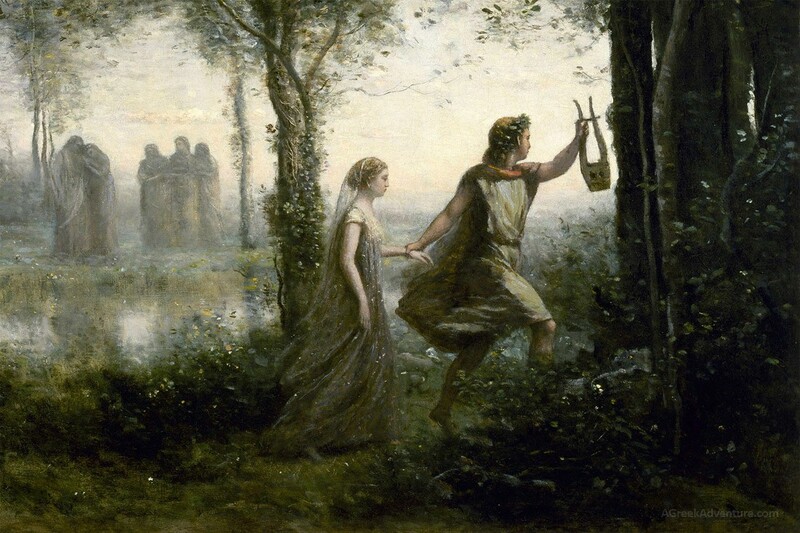 In the original, Hades allows Orpheus to take Eurydice back but she is still a “shade” until she reaches the sunlight and gains human form again, and Orpheus must not look back until she is in the sunlight. Because she does not have a body, when she walks behind Orpheus she does not make any sound, and Orpheus, fearing he has been tricked by Hades looks back just before he reaches the surface to check she is there, and she is taken back to the Underworld. Lesson #1 people – HAVE FAITH. 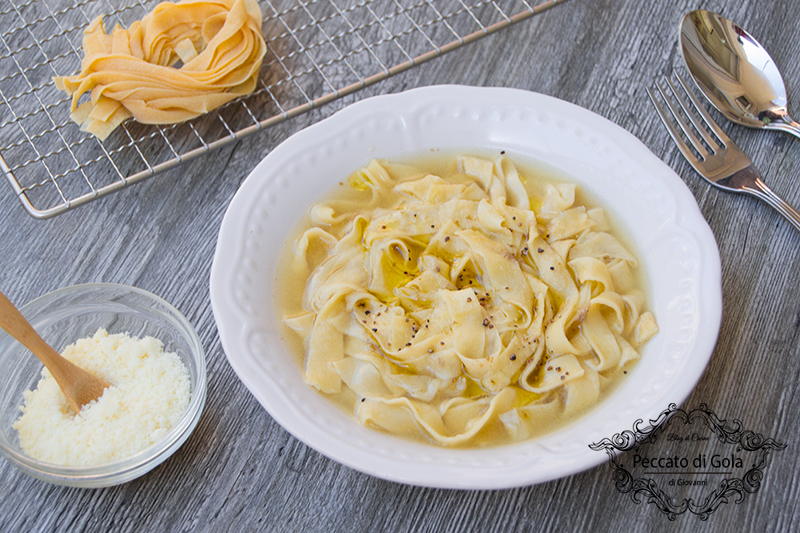 Today’s recipe is for a version of pasta in brodo from the cookery book Opera (first published 1570) from Bartolomeo Scappi, who was active from 1536 to 1570 – the period of this opera. I chose it, partly because it is contemporary Italian, partly because I am a fan of pasta in brodo, and partly because of the coincidence of names (“opera” in the book’s title means “works” or “actions”). Note that the soup can be made with broth or milk and that the seasonings include sugar and cinnamon. By all means boil up a crane or hare to make your broth. Work two pounds of flour, three eggs and warm water into a dough, kneading it on a table for a quarter of an hour. Roll it out thin with a rolling pin and let the sheet of dough dry a little. Trim away the irregular parts, the fringes, with a cutting wheel. When it has dried, though not too much because it will break up, sprinkle it with flour through a sieve so it will not stick. Then take the rolling pin and, beginning at one end, wrap the whole sheet loosely on to the pin, draw the pin out and cut the rolled-up dough crosswise with a broad, thin knife. When they are cut, flatten them. Let them dry out a little and, when they are dry, shake off the excess flour through a sieve. Make a soup of them with a fat meat broth, or milk and butter. When they are cooked, serve them hot with cheese, sugar and cinnamon. If you want to make lasagnas of them, cut the dough lengthwise on the pin, and likewise divide it lengthwise in two, and cut that into little squares. Cook them in the broth of a hare, a crane or some other meat, or in milk. Serve them hot with cheese, sugar and cinnamon. 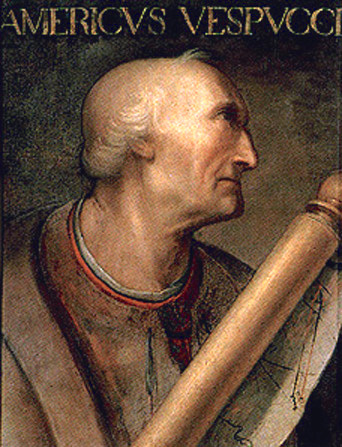 Today is the birthday (1454) of Amerigo Vespucci, a contemporary of Christopher Columbus who also explored the New World by ship, and first demonstrated in about 1502 that Brazil and the West Indies did not represent Asia’s eastern outskirts as initially conjectured from Columbus’ voyages, but instead constituted an entirely separate landmass hitherto unknown to people of the Old World. Because of his exploration and cartography, the continent he explored (actually 2 continents) was named for him. 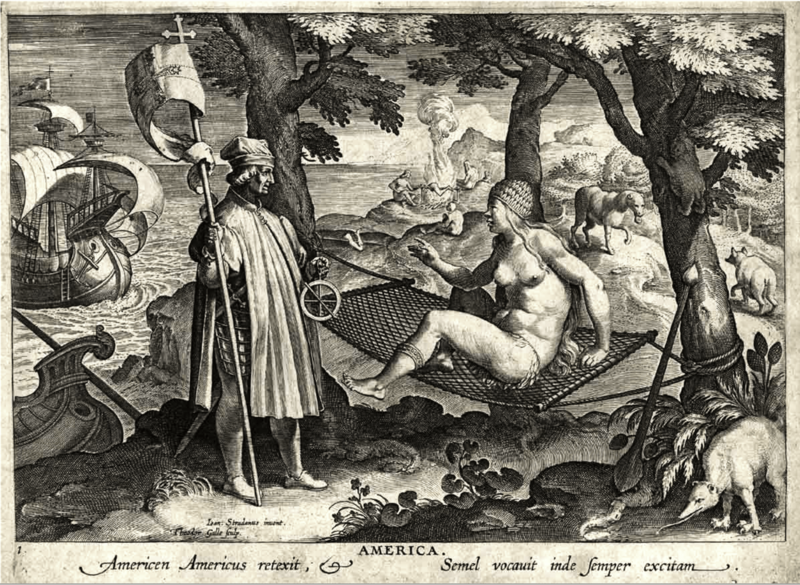 The Latin version of Amerigo is Americus (masculine). The Latin feminine is America. Why continents are feminine in Romance languages is just one of the mysteries of linguistics you will have to sort out on your own. My pet peeve is more basic. As a native Argentino, I am as American as any Chilean, Bolivian, Mexican, or Canadian, and I resent citizens of the United States of America commandeering “American” and “America” for their nation only when they ought to apply to all peoples and nations of both continents. I doubt Vespucci would have approved. In many languages there are words for citizens of the U.S. that do not confuse the country with the continents. Estadounidense is used in most South American Spanish dialects, for example. English ought to be able to come up with something. Vespucci was born and raised in Florence, the third son of Ser Nastagio (Anastasio) Vespucci, a Florentine notary, and Lisabetta Mini. 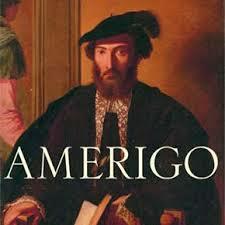 His paternal grandfather also bore the name Amerigo Vespucci. Vespucci was educated by his uncle, Fra Giorgio Antonio Vespucci, a Dominican friar of the monastery of San Marco in Florence. 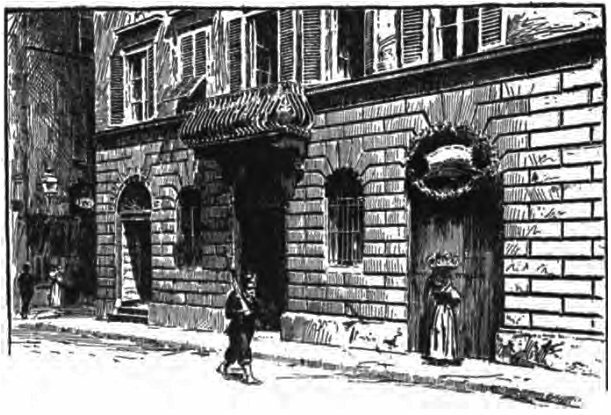 While his elder brothers were sent to the University of Pisa to pursue scholarly careers, Amerigo Vespucci embraced a mercantile life, and was hired as a clerk by the Florentine commercial house of Medici, headed by Lorenzo de’ Medici. Vespucci acquired the favor and protection of Lorenzo di Pierfrancesco de’ Medici who became the head of the business after the elder Lorenzo’s death in 1492. In March 1492, the Medici dispatched the 38-year-old Vespucci and Donato Niccolini as confidential agents to look into the Medici branch office in Cádiz, whose managers and dealings were under suspicion. In April 1495, by the intrigues of Bishop Juan Rodríguez de Fonseca, the Crown of Castile broke their monopoly deal with Christopher Columbus and began handing out licenses to other navigators for the West Indies. Just around this time (1495–96), Vespucci was engaged as the executor of Giannotto Berardi, an Italian merchant who had recently died in Seville. Vespucci organized the fulfillment of Berardi’s outstanding contract with the Castilian crown to provide twelve vessels for the Indies. After these were delivered, Vespucci continued as a provision contractor for Indies expeditions, and is known to have secured beef supplies for at least one (if not two) of Columbus’ voyages. At the invitation of king Manuel I of Portugal, Vespucci participated as observer in several voyages that explored the east coast of South America between 1499 and 1502. On the first of these voyages he was aboard the ship that discovered that South America extended much further south than previously thought. The expeditions became widely known in Europe after two accounts attributed to Vespucci were published between 1502 and 1504. 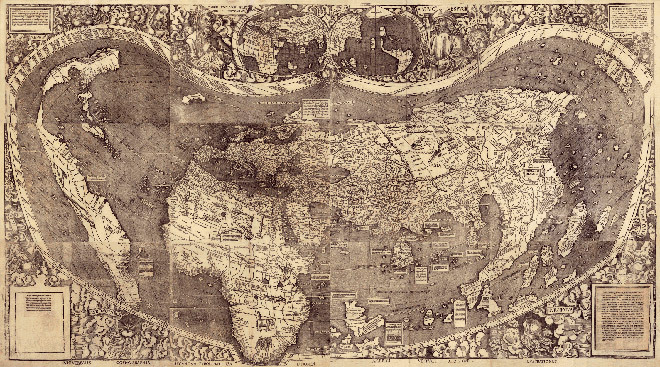 In 1507, Martin Waldseemüller produced a world map on which he named the new continent America after Vespucci. In an accompanying book, Waldseemüller published one of the Vespucci accounts, which led to criticism that Vespucci was trying to upset Christopher Columbus’ glory. However, the rediscovery in the 18th century of other letters by Vespucci has led to the view that the early published accounts, notably the Soderini Letter, could be fabrications, not by Vespucci, but by others. In 1508, the position of chief of navigation of Spain (piloto mayor de Indias) was created for Vespucci, with the responsibility of planning navigation for voyages to the Indies. Two letters attributed to Vespucci were published during his lifetime. Mundus Novus (New World) was a Latin translation of a lost Italian letter sent from Lisbon to Lorenzo di Pierfrancesco de’ Medici. 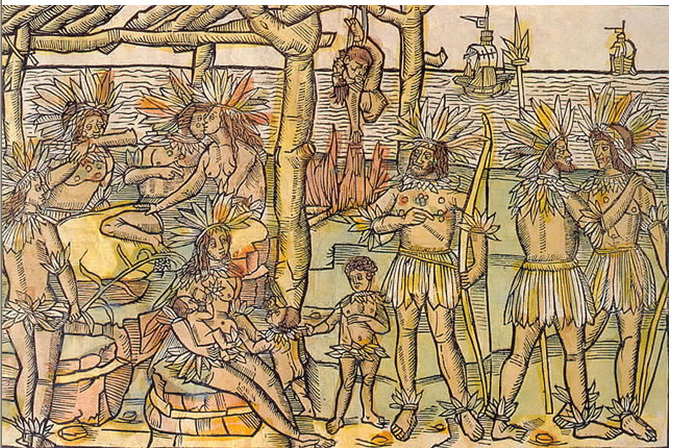 It describes a voyage to South America in 1501–1502. Mundus Novus was published in late 1502 or early 1503 and soon reprinted and distributed in numerous European countries. Lettera di Amerigo Vespucci delle isole nuovamente trovate in quattro suoi viaggi (Letter of Amerigo Vespucci concerning the isles newly discovered on his four voyages), also known as Lettera al Soderini or just Lettera, was a letter in Italian addressed to Piero Soderini. Printed in 1504 or 1505, it claimed to be an account of four voyages to the Americas made by Vespucci between 1497 and 1504. A Latin translation was published by Martin Waldseemüller in 1507 in Cosmographiae Introductio, a book on cosmography and geography, as Quattuor Americi Vespucij navigationes (Four Voyages of Amerigo Vespucci). Vespucci’s real historical importance may well rest more in his letters than in his discoveries. From these letters, the European public learned about the newly discovered continents of the Americas for the first time within a few years of their publication. There is ongoing debate concerning the actual authorship of the letters and their veracity. It is possible that the first and fourth voyages are fabricated, but the second and third are certain. A letter published in 1504 purports to be an account by Vespucci, written to Soderini, of a lengthy visit to the New World, leaving Spain in May 1497 and returning in October 1498. However, some modern scholars have doubted that this voyage took place, and consider this letter a forgery. Whoever did write the letter makes several observations of native customs, including use of hammocks and sweat lodges. About 1499–1500, Vespucci joined an expedition in the service of Spain, with Alonso de Ojeda (or Hojeda) as the fleet commander. The intention was to sail around the southern end of the African mainland into the Indian Ocean. After hitting land at the coast of what is now Guyana, the two seem to have separated. Vespucci sailed southward, discovering the mouth of the Amazon River and reaching 6°S before turning around and seeing Trinidad and the Orinoco River, and returning to Spain by way of Hispaniola. The letter, to Lorenzo di Pierfrancesco de’ Medici, claims that Vespucci determined his longitude celestially on August 23, 1499, while on this voyage. However, that claim may be fraudulent. The last certain voyage of Vespucci was led by Gonçalo Coelho in 1501–1502 in the service of Portugal. Departing from Lisbon, the fleet sailed first to Cape Verde where they met two of Pedro Álvares Cabral’s ships returning from India. In a letter from Cape Verde, Vespucci says that he hopes to visit the same lands that Álvares Cabral had explored, suggesting that the intention is to sail west to Asia, as on the 1499–1500 voyage. On reaching the coast of Brazil, they sailed south along the coast of South America to Rio de Janeiro’s bay. If his own account is to be believed, he reached the latitude of Patagonia before turning back, although this also seems doubtful, since his account does not mention the broad estuary of the Río de la Plata, which he must have seen if he had sailed that far south. Portuguese maps of South America, created after the voyage of Coelho and Vespucci, do not show any land south of present-day Cananéia at 25° S, so this may represent the southernmost extent of their voyages. After the first half of the expedition, Vespucci mapped Alpha and Beta Centauri, as well as the constellation Crux, the Southern Cross, and the Coalsack Nebula. Although these stars had been known to the ancient Greeks, gradual precession had lowered them below the European horizon so that they had been forgotten. On his return to Lisbon, Vespucci wrote in a letter that the land masses they explored were much larger than anticipated and different from the Asia described by Ptolemy or Marco Polo and therefore, must be a New World, that is, a previously unknown fourth continent, after Europe, Asia, and Africa. Vespucci’s fourth voyage was another expedition for the Portuguese crown down the eastern coast of Brazil, that set out in May 1503 and returned to Portugal in June 1504. Like his alleged first voyage, Vespucci’s last voyage in 1503–1504 is also disputed to have taken place. The only source of information for the last voyage is the Letter to Soderini, but as several modern scholars dispute Vespucci’s authorship of the letter to Soderini, it is also sometimes doubted whether Vespucci undertook this trip. 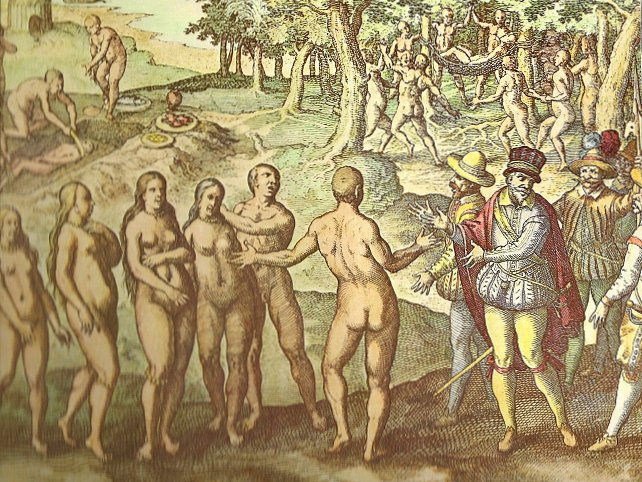 However, Portuguese documents do confirm a voyage to Brazil was undertaken in 1503–04 by the captain Gonçalo Coelho, very likely the same captain of the 1501 mapping expedition (Vespucci’s third voyage), and so it is quite possible that Vespucci went on board this one as well. However, it is not independently confirmed Vespucci was aboard and there are some difficulties in the reported dates and details. The letters caused controversy after Vespucci’s death, especially among the supporters of Columbus who believed Columbus’ priority for the discovery of America was being undermined, and seriously damaged Vespucci’s reputation. Not long after his return to Spain, Vespucci became a Spanish citizen. On March 22, 1508 he was made the pilot major of Spain by Ferdinand II of Aragon in honor of his discoveries. Vespucci also ran a school for navigators in the Spanish House of Trade, based in Seville. He died on February 22, 1512 at his home in Seville. The first recipe to be used for pasta is unusual in that it uses both rosewater and sugar. The second is a fairly standard recipe for pasta in brodo although you may have trouble making a broth from hare or crane. The recipe for making the noodles shows that nothing much has changed in 500 years. Work two pounds of flour, three eggs and warm water into a dough, kneading it on a table for a quarter of an hour. Roll it out thin with a rolling pin and let the sheet of dough dry a little. Trim away the irregular parts, the fringes, with a rolling wheel. When it has dried, though not too much because it would break up, sprinkle it with flour through a sieve so it will not stick. Then take the rolling pin and, beginning at one end, wrap the whole sheet loosely on it. Remove the rolling pin and cut the rolled-up dough crosswise with a broad, thin knife. When they are cut open them [the noodles] out. Let them dry out a little and, when they are dry, filter off the excess flour through a sieve. Make up a soup of them with a fat meat broth, or milk and butter. When they are cooked, serve them hot with cheese, sugar and cinnamon. If you want to make lasagna of them, cut the dough lengthwise on the pin, and likewise divide it lengthwise in two, and cut that into little squares. Cook them in the broth of a hare, a crane or some other meat, or in milk. Serve them hot with cheese, sugar and cinnamon.